On my weekends while attending acupuncture school, I worked at Hooper Center, a state rehabilitation program in Portland, Ore. We used ear acupuncture to treat alcoholics and addicts, many of whom were homeless. As a counselor, I listened to story after story from junkies who embarked on their addiction after a medical doctor prescribed them Vicodin or Oxycontin or Percocet. They found a much more accessible opiate pain-killing remedy from street dealers—an irresistible high and a cheaper fix. Black tar heroin, known as chiva in Spanish, is a gooey, charcoal-hard sludge derived from the husk of the poppy flower. After being cut with a potpourri of adulterants, it is cooked in a spoon, sucked into a syringe and injected into the vein. This cheap grade of heroin, the most common dope in the western United States, comes not from the opium empires of Asia but from Mexico. One of the primary routes for moving chiva and other illicit drugs out of Latin America is a 50-mile rural stretch running along the Rio Grande River. The pipeline begins on the outskirts of the one-time murder capital of the world—Ciudad Juárez. My friend Beatrice Rodriguez meets me at a pit stop off Interstate 10 between El Paso and Fort Hancock, Tex. We drive through the small town of Fabens, weave down dirt roads through outlying fields and orchards and pass through the Mexican border crossing into the valley of Juárez. The minute we cross I see a young, armed soldier stationed behind a military camouflaged bunker off the side of the road and a street full of abandoned shops. Beatrice tells me not to worry. Only one shop shows signs of life and is obviously open: Del Rio, a chain corner store. We drive up the valley along the dust-blown highway passing torched and abandoned ranches. Black-burnt reeds color the polluted irrigation ditches along the road as we enter a town called Barriales, Beatrice’s home. Across the street from Beatrice’s house stands a park, a typical Mexican town plaza with benches and bushes and trees. At the gazebo, arrows from every direction point to a single dot, above which reads punto de reunión (meeting point). We walk around the plaza and Beatrice reminisces about what it was like “before the violence.” Dancing. Music. Elotes (char-grilled corn). Neighbors peddling tamales and tacos while children played and people laughed. Flirting teenagers playing cat and mouse, circling the plaza. Beatrice and her husband lived across the street from the family-oriented center of a tight-knit town. They raised their children here. He worked the cotton fields down the road, and she ran the mini-market attached to their home. She sold ice cream and soda and bread and tortillas and beans and rice. Her store also served as Barriales’s makeshift post office. She points down a dirt road to a nearby town where she used to purchase bread from the bakery of a longtime activist family in the valley—the Reyes-Salazars. Then things changed. In 2006, Mexico’s president declared war on the drug cartels. The federal police were sent to patrol and police the valley. Beatrice watched as almost every one of her neighbors was either killed or forced to flee. Some of the Reyes-Salazar family were killed. Other members of the family sought asylum in the United States. One staged a hunger strike in front of Mexico’s capital to raise awareness about the situation in the valley of Juárez. Even with the increasing violence, Beatrice kept her store open. It became more difficult after her husband died of a heart attack in 2010, but she managed to keep things afloat until Lent of the following year. Murder rates and the level of violence in Juárez had fallen. It was an Ash Wednesday in 2011. Beatrice was preparing for the church services and the beginning of Lent. A waste disposal truck parked just outside the store. She sold the three garbagemen some bottled Cokes to wash down their lunch. The three men sat down together on the plaza benches, relaxing in the shade of the trees and shoving food into their mouths with soiled hands. Beatrice walked back into the store and suddenly heard gunshots. She rushed to the door, secured the locks and stayed inside for an hour. That is how the neighborhood rationalized death. Beatrice closed the store. Today on our walk the plaza is overgrown with weeds. A wandering street dog sniffs about for garbage scraps. Surrounding streets are empty. A basketball court, unused, remains lit each night. The hoops have been stolen—just backboards on a pole remain. The predominant sound on the block is the swamp cooler attached to a boarded-up home, spray-painted with “Tacos. Barbacoa,” advertising a home business struggling to stay alive. Beatrice and I get into her car and leave the plaza behind, so she can show me the surrounding towns. We take the highway running parallel to the dry Rio Grande River. Beatrice points out skeletons of deserted ranches and plants. Burnt paint shards cling to cinderblock foundations of homes of residents who vanished: chased away or killed. She will never know what happened to many; most people who fled never left a trail. They were scattered and blown away like the drought-stricken earth remaining on their abandoned farmfields. Beatrice talks about the exodus of her people. Her eyes widen and with a serious but tender glance from under her wide-rounded, gold-rimmed glasses, she says, Ahora no mas es el Valle de Juárez. Es el valle de lágrimas y tristeza. In 2010, Ciudad Juárez—the border city 30 miles northwest from her home—witnessed more murder than the entire country of war-torn Afghanistan. In the rural valley encompassing Barriales, however, murder rates were six times higher than those wartime rates: over 1,200 killings per 100,000 inhabitants. Unemployment, violence, extortion and insecurity drove away the majority of valley residents. Beatrice says that 90 percent of the population of Barriales has fled or been killed since 2008. Just 25 out of the former 200 families in Barriales remain. The valley’s population of 60,000 fell to 5,000 in five years. Those who stayed were either too sick or too poor to find a way out, she tells me. We return to Beatrice’s house in Barriales to meet up with her best friend, Sister María Eugenia Escobedo, for coffee and snacks. In 2006 Sister María Eugenia worked in Portland, Ore. Then the Sisters of Our Sorrowful Mother reassigned her, 1,700 miles back, to serve where she grew up, here in the valley of Juárez. Today she and Beatrice operate a food bank at the churches, stocked by local donations of canned goods, beans and rice. Beatrice brings us coffee, and we sit around her dining room. They both insist they are not afraid to live here or work here. Our conversation shifts to Sister María Eugenia’s complaints about the dwindling church congregation, the low turnout at her catechism classes and how hard it is to serve people in the valley. “The people who remain are too scared to come out of their homes to ask for help,” she laments. We make a short visit to Beatrice’s only remaining family member in the valley, her sister, a block away. Beatrice’s sister lost a son two years ago. He was working at a construction site when a truckload of men pulled up, shoved him inside and stole him away. They found his body three days later; but, as for most murders in Mexico, no investigation was ever conducted. We walk next door to the Sacred Heart of Jesus Church, and they take me to Benito Juárez elementary school, a block away. Over 200 students attended in 2008. Only a few remain. Sister María Eugenia says families here come and go. Kids arrive for class the first time one day, and the next, they have crossed north. The valley is a stopping point for many immigrant families before they make the last leap across the river in search of freedom and safety and comfort. “Be open, ears!” With that the man could speak and hear. The Rev. Eliseo Ramírez preaches that this is a story about learning to open up and to ask for the help of the community—about learning how to pray. He invites the 20 parishioners in attendance to stay and receive a group ear acupuncture session afterwards, a new service launched by the diocese to aid people affected by the violence. Six stay. Sitting in the first few pews in front of the altar, Beatrice and Sister María Eugenia place three needles into points in each of their ears. They remain for 40 minutes together in silence. Beatrice and Sister María Eugenia were some of our first students in ear acupuncture training organized by the vicar of the diocese, Msgr. René Blanco, in 2008. 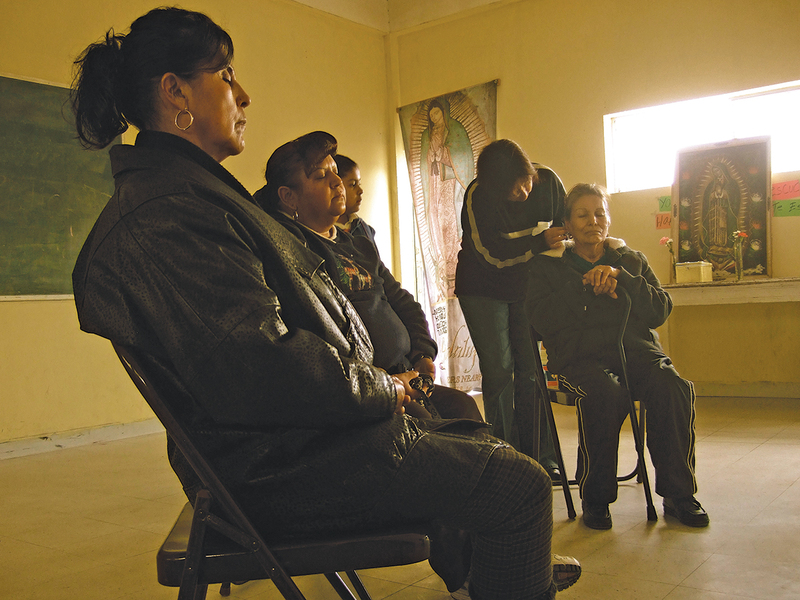 A charismatic Juárez native with liberation theology roots, he envisioned the ear acupuncture groups—offered free by parish volunteers—to be a part of improving the church’s efforts to promote peace and aid people affected by the trauma of war. One of the places identified was the parish of Guadalupe in the valley. From there he invited Sister María Eugenia. She decided she would go if she could convince her friend Beatrice. “What is acupuncture?” Beatrice asked Sister María Eugenia as they debated whether or not to attend the training. They knew nothing about oriental medicine, or ear therapy. But they knew and trusted Monsignor René. Monsignor Blanco brought in pastoral workers, mostly women, working with the poor in far fringe colonias of the diocese. Some of the first students were maquila (factory) workers. Many were now former maquila workers, after being laid off short of their pensioning age of 40. Most of them were not from Juárez but from the southern states of Chiapas, Veracruz and Guerrero. They originally came north for jobs and a future. Volunteer acupuncturists from Portland pitched in to make it possible to train these workers. Today the local priest sends Sister María Eugenia and Beatrice to treat and administer sacraments to the sick and homebound. Beatrice applies ear needles to her next-door neighbor suffering from severe pain brought on by lung cancer. The treatment takes the pain away for an hour or two. Most residents seek the service out themselves by simply knocking on the door of the mini-mart. Perhaps the encounters help with physical symptoms. Maybe they help with spiritual ones. At 4:30 a.m. eight buses will arrive from the city in the bare plaza of Barriales, and the maquiladora workers will descend from their night shift. Then other residents, waiting on a thin blue metal bench under a small shelter, will climb on for their ride out for the day shift. At 4:30 p.m., the buses will return again to pick up the night crew. If there is any future for residents of the valley, there will need to be more of these buses. Beatrice hopes that multinational corporations will open up new maquilas that can bring jobs. However, the trends over the last two decades suggest a more sinister future. In the 1990s, after Nafta caused the price of corn to plummet, opium and other drug trafficking rose along with an increase in the number of multinational corporations in the border region. Failing farmers from throughout Mexico poured into Ciudad Juárez. Factory owners created urban slums for the workers to survive in but did not pay them a living wage. Then in 2008, the U.S. economy crashed. The maquilas closed, workers lost jobs, and the industry of drugs alongside the business of trafficking people and guns across the valley of Juárez boomed. Today the valley’s soil, fouled by fracking and upstream factories, is of little use for agriculture or life. Recently oil and natural gas have been discovered. A pipeline through the valley funded by the Mexican billionaire Carlos Slim will be built next year. After saying goodbye to Sister María Eugenia and Beatrice, I pass over the brand new, high-tech border crossing still under construction at Caseta, a few blocks from the narrow bridge, that divides Texas from Mexico. As I pass through the rusted steel 20-foot-tall gate opening into the United States, two men hawk pirated DVD’s and chicles (chewing gum). Ahead are a few small duck ponds surrounded by chain link fences that line the weaving road leading up to the customs station. During the routine search before I am allowed to enter my country, the agents rip out and destroy a panel in my truck searching for drugs. They do not repair it, nor do they apologize. And there is yet more news of death. I return to visit Beatrice in Easter of 2015, and I see more signs of desertion in the valley. She describes a recent surge in violence since January. Her neighbor, one of the last farmers there, went missing and was later dug out of a hole along with other mutilated corpses. This is not the first clandestine grave to be excavated. Others like this across northern Mexico’s desert have been found to contain the bodies of immigrants from Central and South America, their journey stopped just short of the border. There are reportedly many more undiscovered death pits, and there are many, many more human beings coming to the United States seeking refuge. Silent, humble and often unrecognized, people living in “their” world south of our borders, people like Beatrice, are making their broken world better day in, day out. They are saints in their region. Each time I have spoken with Beatrice since 2011 she talks about the future of the valley with an unblemished optimism. It is mas tranquila ahora. Beatrice does not have to stay in the valley of Juárez. She has dual citizenship. She has 50 nephews and nieces, eight brothers and sisters in all. All of these relatives except one sister have moved across the border. They beg her to leave her home behind and join them in the safety of the United States. She could move in with them over in Fabens at any moment. All that remains of Beatrice’s old mini-mart is an ancient, dusty payphone booth, disconnected and out of service. A white coat of paint covers the old advertisements painted on the outside wall, hiding the store it once was. Only a telephone company sign hanging above her door is a sign to the world that the people of Barriales used to come here to make phone calls. Neighbors knock on her door. She welcomes them in, places three needles in their ears. Some share their stories. Others just sit in silence as she holds the space. Editor's note: This article is also available in Spanish: "Construyendo un Mundo Mejor en el Valle de Juárez"
This article also appeared in print, under the headline "Valley of Sorrows," in the February 15, 2016 issue. Ryan Bemis, a doctor of oriental medicine, works as a teacher and community acupuncturist and organizer in the United States/Mexico border region. He is founder of Crossroads Community Supported Healthcare in Las Cruces, N.M., and of Promotores Descalzos (Barefoot Health Promoters), a community acupuncture school in the Diocese of Ciudad Juárez.